The Open Top Safety Gate is designed for applications that feature tall pallet loads or integration with overhead devices like vacuum hoists or cranes. Without overhead mechanics, the gate accommodates extremely tall pallet loads while using dual-counterbalanced gates to provide a safe environment for workers in pallet drop areas. 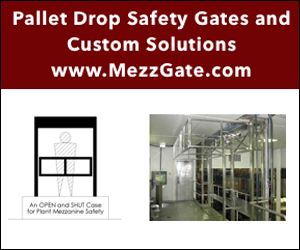 Open Top Safety gates come in standard sizes, can be customized for specific applications and meet OSHA, ANSI and IBC standards.